For other people named Margaret White, see Margaret White. 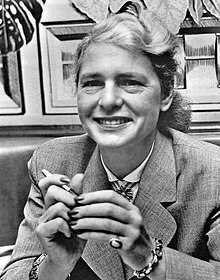 Margaret Bourke-White (/ˈbɜːrk/; June 14, 1904 – August 27, 1971) was an American photographer and documentary photographer. She is best known as the first foreign photographer permitted to take pictures of Soviet industry under the Soviet's five-year plan, the first American female war photojournalist, and having one of her photographs (the construction of Fort Peck Dam) on the cover of the first issue of Life magazine. She died of Parkinson's disease about eighteen years after developing symptoms. Margaret Bourke-White, born Margaret White in the Bronx, New York, was the daughter of Joseph White, a non-practicing Jew whose father came from Poland, and Minnie Bourke, who was of Irish Catholic descent. She grew up in Bound Brook, New Jersey (in a neighborhood now part of Middlesex), and graduated from Plainfield High School in Union County. From her naturalist father, an engineer and inventor, she claimed to have learned perfectionism; from her "resourceful homemaker" mother, she claimed to have developed an unapologetic desire for self-improvement." Her younger brother, Roger Bourke White, became a prominent Cleveland businessman and high-tech industry founder, and her older sister, Ruth White, became well known for her work at the American Bar Association in Chicago, Ill. Roger Bourke White described their parents as "Free thinkers who were intensely interested in advancing themselves and humanity through personal achievement," attributing this quality in part to the success of their children. He was not surprised at his sister Margaret's success, saying "[she] was not unfriendly or aloof". Margaret's interest in photography began as a hobby in her youth, supported by her father's enthusiasm for cameras. Despite her interest, in 1922, she began studying herpetology at Columbia University, only to have her interest in photography strengthened after studying under Clarence White (no relation). She left after one semester, following the death of her father. She transferred colleges several times, attending the University of Michigan (where she became a member of Alpha Omicron Pi sorority), Purdue University in Indiana, and Western Reserve University in Cleveland, Ohio. Bourke-White ultimately graduated from Cornell University with a Bachelor of Arts degree in 1927, leaving behind a photographic study of the rural campus for the school's newspaper, including photographs of her famed dormitory, Risley Hall. A year later, she moved from Ithaca, New York, to Cleveland, Ohio, where she started a commercial photography studio and began concentrating on architectural and industrial photography. In 1924, during her studies, she married Everett Chapman, but the couple divorced two years later. Margaret White added her mother's surname, "Bourke" to her name in 1927 and hyphenated it. One of Bourke-White's clients was Otis Steel Company. Her success was due to her skills with both people and her technique. Her experience at Otis is a good example. As she explains in Portrait of Myself, the Otis security people were reluctant to let her shoot for many reasons. Firstly, steel making was a defense industry, so they wanted to be sure national security was not endangered. Second, she was a woman, and in those days, people wondered if a woman and her delicate cameras could stand up to the intense heat, hazard, and generally dirty and gritty conditions inside a steel mill. When she finally got permission, technical problems began. Black-and-white film in that era was sensitive to blue light, not the reds and oranges of hot steel, so she could see the beauty, but the photographs were coming out all black. She solved this problem by bringing along a new style of magnesium flare, which produces white light, and having assistants hold them to light her scenes. Her abilities resulted in some of the best steel factory photographs of that era, which earned her national attention. "To me... industrial forms were all the more beautiful because they were never designed to be beautiful. They had a simplicity of line that came from their direct application of purpose. Industry... had evolved an unconscious beauty - often a hidden beauty that was waiting to be discovered" Margaret Burke-White, Portrait of Myself (New York: Simon and Shuster, 1963), 49. In 1929, Bourke-White accepted a job as associate editor and staff photographer of Fortune magazine, a position she held until 1935. In 1930, she became the first Western photographer allowed to take photographs of Soviet industry. She was hired by Henry Luce as the first female photojournalist for Life magazine in 1936. She held the title of staff photographer until 1940, but returned from 1941 to 1942, and again in 1945, after which she stayed through her semi-retirement in 1957 (which ended her photography for the magazine) and her full retirement in 1969. 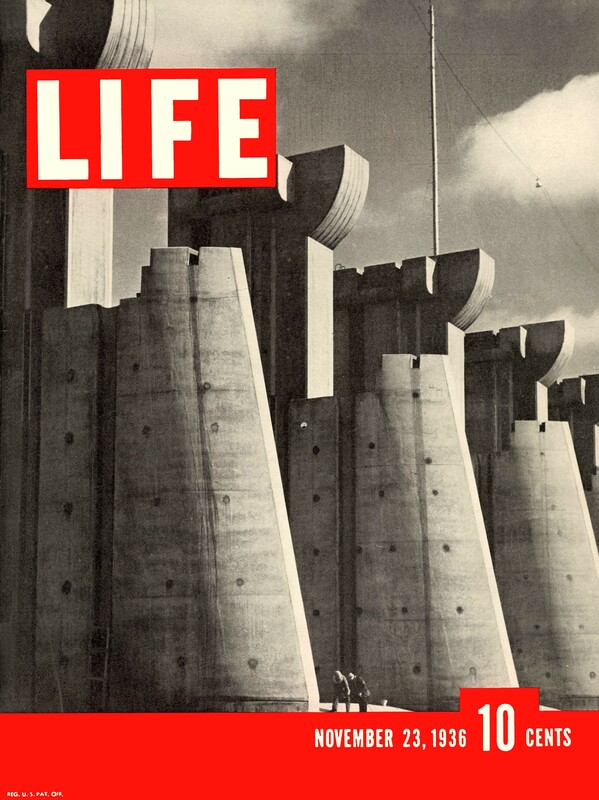 Her photographs of the construction of the Fort Peck Dam were featured in Life's first issue, dated November 23, 1936, including the cover. This cover photograph became such a favorite (see ) that it was the 1930s' representative in the United States Postal Service's Celebrate the Century series of commemorative postage stamps. "Although Bourke-White titled the photo, New Deal, Montana: Fort Peck Dam, it is actually a photo of the spillway located three miles east of the dam," according to a United States Army Corps of Engineers web page. During the mid-1930s, Bourke-White, like Dorothea Lange, photographed drought victims of the Dust Bowl. In the February 15, 1937 issue of Life magazine, her famous photograph of black flood victims standing in front of a sign which declared, "World's Highest Standard of Living", showing a white family, was published. The photograph later would become the basis for the artwork of Curtis Mayfield's 1975 album, There's No Place Like America Today. Bourke-White and novelist Erskine Caldwell were married from 1939 to their divorce in 1942, and collaborated on You Have Seen Their Faces (1937), a book about conditions in the South during the Great Depression. She also traveled to Europe to record how Germany, Austria, and Czechoslovakia were faring under Nazism and how Russia was faring under Communism. While in Russia, she photographed a rare occurrence, Joseph Stalin with a smile, as well as portraits of Stalin's mother and great-aunt when visiting Georgia. Bourke-White was the first female war correspondent and the first woman to be allowed to work in combat zones during World War II. In 1941, she traveled to the Soviet Union just as Germany broke its pact of non-aggression. She was the only foreign photographer in Moscow when German forces invaded. Taking refuge in the U.S. Embassy, she then captured the ensuing firestorms on camera. As the war progressed, she was attached to the U.S. Army Air Force in North Africa, then to the U.S. Army in Italy and later in Germany. She repeatedly came under fire in Italy in areas of fierce fighting. "The woman who had been torpedoed in the Mediterranean, strafed by the Luftwaffe, stranded on an Arctic island, bombarded in Moscow, and pulled out of the Chesapeake when her chopper crashed, was known to the Life staff as 'Maggie the Indestructible.'" This incident in the Mediterranean refers to the sinking of the England-Africa bound British troopship SS Strathallan that she recorded in an article, "Women in Lifeboats", in Life, February 22, 1943. She was disliked by General Dwight D Eisenhower but was friendly with his chauffeur/secretary, Irishwoman Kay Summersby, with whom she shared the lifeboat. In the spring of 1945, she traveled throughout a collapsing Germany with Gen. George S. Patton. She arrived at Buchenwald, the notorious concentration camp, and later said, "Using a camera was almost a relief. It interposed a slight barrier between myself and the horror in front of me." After the war, she produced a book entitled Dear Fatherland, Rest Quietly, a project that helped her come to grips with the brutality she had witnessed during and after the war. "To many who got in the way of a Bourke-White photograph—and that included not just bureaucrats and functionaries but professional colleagues like assistants, reporters, and other photographers—she was regarded as imperious, calculating, and insensitive." Bourke-White is known equally well in both India and Pakistan for her photographs of Dr. Bhimrao Ramji Ambedkar at his home Rajgriha, Dadar in Mumbai on the occasion of a third impression of his book which was published in December 1940 as Thoughts on Pakistan (the book was republished in 1946 under the title India's Political What's What: Pakistan or Partition of India). These photographs were published on LIFE magazine cover. She also photographed M. K. Gandhi at his spinning wheel and Pakistan's founder, Mohammed Ali Jinnah, upright in a chair. She also was "one of the most effective chroniclers" of the violence that erupted at the independence and partition of India and Pakistan, according to Somini Sengupta, who calls her photographs of the episode "gut-wrenching, and staring at them, you glimpse the photographer's undaunted desire to stare down horror." She recorded streets littered with corpses, dead victims with open eyes, and refugees with vacant eyes. "Bourke-White's photographs seem to scream on the page," Sengupta wrote. The photographs were taken just two years after those Bourke-White took of the newly captured Buchenwald. Sixty-six of Bourke-White's photographs of the partition violence were included in a 2006 reissue of Khushwant Singh's 1956 novel about the disruption, Train to Pakistan. In connection with the reissue, many of the photographs in the book were displayed at "the posh shopping center Khan Market" in Delhi, India. "More astonishing than the images blown up large as life was the number of shoppers who seemed not to register them," Sengupta wrote. No memorial to the partition victims exists in India, according to Pramod Kapoor, head of Roli, the Indian publishing house coming out with the new book. She had a knack for being at the right place at the right time: she interviewed and photographed Mohandas K. Gandhi just a few hours before his assassination in 1948. Alfred Eisenstaedt, her friend and colleague, said one of her strengths was that there was no assignment and no picture that was unimportant to her. She also started the first photography laboratory at Life magazine. In 1953, Bourke-White developed her first symptoms of Parkinson's disease. She was forced to slow her career to fight encroaching paralysis. In 1959 and 1961, she underwent several operations to treat her condition, which effectively ended her tremors but affected her speech. In 1971, she died at Stamford Hospital in Stamford, Connecticut, aged 67, from Parkinson's disease. Bourke-White wrote an autobiography, Portrait of Myself, which was published in 1963 and became a bestseller, but she grew increasingly infirm and isolated in her home in Darien, Connecticut. In her living room, there "was wallpapered in one huge, floor-to-ceiling, perfectly-stitched-together black-and-white photograph of an evergreen forest that she had shot in Czechoslovakia in 1938". A pension plan set up in the 1950s, "though generous for that time", no longer covered her health-care costs. She also suffered financially from her personal generosity and "less-than-responsible attendant care." Bourke-White's photographs are in the Brooklyn Museum, the Cleveland Museum of Art, the New Mexico Museum of Art and the Museum of Modern Art in New York as well as in the collection of the Library of Congress. A 160-foot long photomural she created for NBC in 1933, for the Rotunda in the broadcaster's Rockefeller Center headquarters, was destroyed in the 1950s. In 2014, when the Rotunda and Grand Staircase leading up to it were rebuilt, the photomural was faithfully recreated in digital form on the 360-degree LED screens on the Rotunda's walls. It forms one of the stops on the NBC Studio Tour. Many of her manuscripts, memorabilia, photographs, and negatives are housed in Syracuse University's Bird Library Special Collections section. Bourke-White was portrayed by Farrah Fawcett in the television movie, Double Exposure: The Story of Margaret Bourke-White (1989) and by Candice Bergen in the 1982 film Gandhi. In 1990, she was inducted into the National Women's Hall of Fame. She was designated a Women's History Month Honoree in 1992 and again in 1994 by the National Women's History Project. ^ Benton,, Whisenhunt, William; E.,, Saul, Norman. New perspectives on Russian-American relations. p. 193. ISBN 9781138916234. OCLC 918941221. This was the first time a professional photographer from abroad had been allowed to take pictures of the "Piatiletl" (Five-year plan). ^ a b c d e f g Callahan, Sean. "The Last Days of a Legend". Scout Productions. Bullfinch Press. Archived from the original on December 13, 2013. Retrieved March 7, 2017. ^ a b "ULAN Full Record Display - Bourke-White, Margaret". Union List of Artist Names - Getty Research. The J. Paul Getty Trust. Retrieved 2010-06-04. ^ a b c d e f g h i j k l m n o p q r s Gaze, Delia, ed. (1997). Dictionary of Artists, Volume 1. Taylor & Francis. p. 1512. ISBN 9781884964213. ^ a b Roger Bourke White. "Roger White's Autobiography". Retrieved 2010-06-02. ^ "She grew up in Bound Brook, NJ, and graduated from Plainfield High School". Archived from the original on September 12, 2006. Retrieved 2007-06-21. ^ a b c d "Margaret Bourke-White". Gallery M. Retrieved 2006-07-02. ^ "Greek Life NPC Alpha Omicron Pi". Student Affairs. East Carolina University. Retrieved 2010-06-05. ^ Bourke-White, Margaret; Ronald Elroy Ostman; Harry Littell (2005). Margaret Bourke-White: the early work, 1922-1930. David R. Godine Publisher. p. 88. ISBN 9781567922998. ^ Kapoor, Pramod (2010). Witness to Life and Freedom : Margaret Bourke-white In India & Pakistan. New Delhi: Lustre Press, Roli Books. ISBN 978-81-7436-699-3. ^ Bourke-White, Margaret (1949). Halfway to Freedom: A Report on the New India in the Words and Photographs of Margaret Bourke-White. New York: Simon and Schuster. pp. 225–233. ^ Whitman, Alden (August 28, 1971). "Margaret Bourke-White, Photo-Journalist, Dead at 67". The New York Times. Retrieved 2010-03-21. Margaret Bourke-White, one of the world's pre-eminent photographers, died yesterday morning at the Stamford (Conn.) Hospital from complications after a long battle with Parkinson's disease, a nerve disorder. She was 67 years old and lived in Darien, Conn.
^ "Margaret Bourke-White". New Mexico Museum of Art. Retrieved 20 September 2013. ^ a b "Bourke-White, Margaret". Dictionary of Women Artists. Chicago: Fitzroy Dearborn Publishers. 1997. ^ "Honorees: 2010 National Women's History Month". Women's History Month. National Women's History Project. 2010. Retrieved 14 June 2017. Images from Time's image archive by Margaret Bourke-White.